Happy New Year. You aren’t cold, are you? You were praying with a serious expression as well at the New Year shrine visit. I will protect everyone without fail this year too as the general of Uesugi. That is my duty as the one who governs these lands. But… if this were to be permitted, I would like to convey a personal wish to you alone. I want you to continue to be by my side… Won’t you see through to the end, Uesugi’s future, with your own eyes beside me? 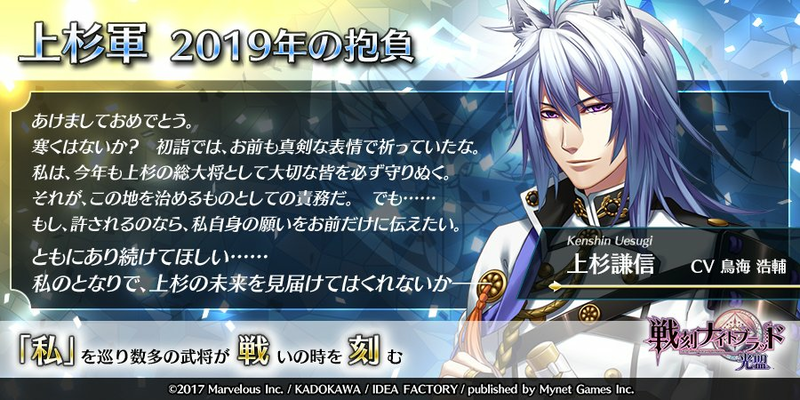 This entry was posted in Collaboration, Otome Games, Sengoku Night Blood and tagged Kadokawa, Marvelous!, Mobile, Otomate, SNB Kenshin. Let's experience this dream together!